Amherst is a former gold mining township 13 km south-west of Maryborough and 135 km north-west of Melbourne. The nearest neighbouring township is Talbot, 5 km southwards. Amherst predates Talbot, and was a borough before gold discoveries brought Talbot into existence. Amherst is on Daisy Hill Creek and is situated at what were once important cross roads. Gold was discovered there at a number of locations during 1852-55. A town was surveyed and town lots sold in 1855. An Anglican school was opened in 1856 and a Presbyterian school in 1860. In addition to those denominations there was also a Wesleyan church (1857). Amherst borough was proclaimed on 22 October 1858. The name probably commemorated Lord Amherst, Governor General of India, later Earl Amherst, who died in 1857. 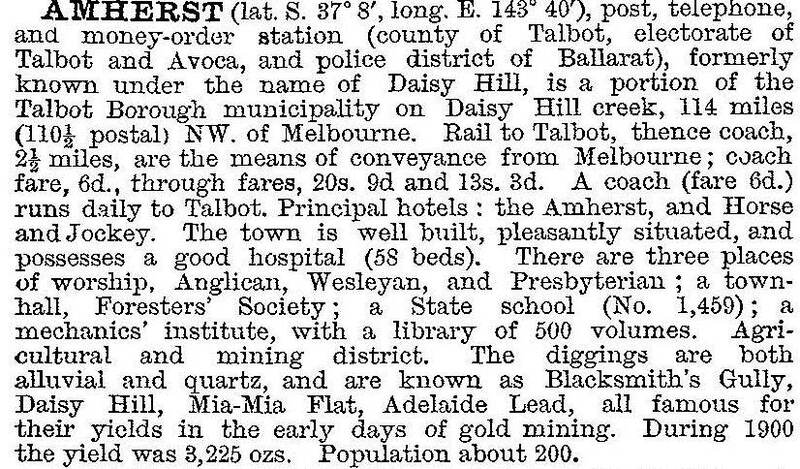 In 1859 gold was discovered at Talbot, and several rich finds followed. Within a few years Talbot rivalled Amherst, and in 1875 Amherst became a ‘suburb’ of Talbot borough. Amherst’s population remained at about 150 to 200 until World War II. Its school closed in 1946 and the hospital functioned as a tuberculosis sanatorium until the 1930s. The scatter of buildings left in Amherst was affected by fire in 1985, but the surveyed street layout on the north side of Daisy Hill Creek is still visible. The school building (1874) has been reconstructed, and the cemetery, reservoir and basalt road culverts are further signs of the gold mining borough. It is surrounded by old gold workings, and there is State forest to the north. The Amherst vineyard was planted in 1989 on land 20 km south-east of Avoca and the Amherst Winery markets its 'Daisy Creek' red and white wine. Evidence of the gold diggings can be seen around the vineyard in the quartz rich soil.